Education Startups Have You Applied For LAUNCHedu At SXSW? Last year when we decided to head down a little earlier than we traditionally do for SXSWi, we were quite surprised at what we saw with LAUNCHedu and SXSWedu. 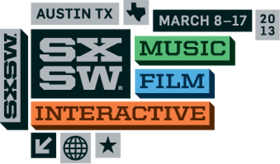 For those unaware, SXSW hosts an entire conference a week earlier than SXSW Interactive, SXSW Music and SXSW Film. 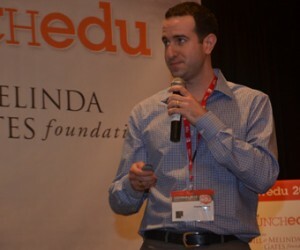 That conference, SXSWedu, celebrates education, technology, and edtech startups. Like the SXSWi accelerator, SXSWedu has it’s own startup track called LAUNCHedu which functions almost like the SXSW Interactive accelerator. The pitch and startup contest pits the best of the best educational startups from across the country against each other in front of startup influences like Mitch Kapor from Kapor Capital. Many VC’s and angels have found that SXSWedu finds startups on the cusp of greatness. 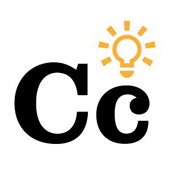 At last year’s event we met great startups like Common Curriculum, a Baltimore based company that has created an easy to use platform for teachers to develop curriculum. We also got to spend time with MatchBox, a startup that has put the college application process entirely on an iPad. We even got to spend time with Clever, the startup that won the K-12 category at LAUNCHedu. This company provides a platform that connects educational software providers with legacy student information systems and makes it all talk to each other. If you’re an edtech startup and meet these requirements than you want to head over to the SXSWedu site before November 8th and register. It’s been said that SXSWedu is growing faster than the SXSW Interactive festival grew when it was first added. It falls the week before SXSWi in March. 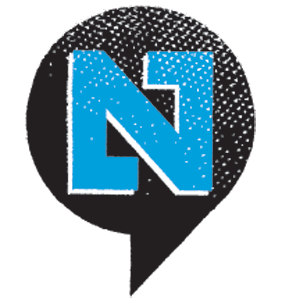 Nibletz celebrated their first birthday as “The Voice Of Startups Everywhere Else” at South By Southwest 2013. The idea was born last year after the now infamous Startup Bus standoff. That’s when founder, and content director, Kyle Sandler (that’s me and I hate writing in third person), found that there were so many more startups outside Silicon Valley, than inside. 94% to be exact. With that an idea was born and we immediately went to bootstrapping. Well our two man team, and our photographer put the words sneaker-strapped to entirely new levels. First off we would not have been able to perform like we did if it wasn’t for the “free food for founders” GroupMe group at SXSW. That list kept us informed for 5 days as to where all the great food was. We also could not have done it without the help of Kelly Krause at the SXSW press office. You see in the previous four years we had press credentials through my previous site thedroidguy. This year, in planning everywhereelse.co The Startup Conference, we totally forgot the press deadline. A little groveling and some sponsor help allowed us to strike a deal with Krause and the SXSW press team where we came in early, covered the crap out of SXSWedu (which was a great show) and they would let our little oversight get swept under the rug. (that will never happen again). We stayed 20 miles out and took a combination of buses to get to and from the hotel. We caught up on a lot of rest in the Hilton lobby. And we truly brought out the voice of startups everywhere else. Now as we get back on the road to again continue our roadtrip we need some major community support. We’re sneaker strapping it and we’re reader supported. We are charged with being on the road for the balance of 2013 as we wrap up our book that will be released Q4 2013. We’ve already been to 65 cities now and plan on visiting another 40 more. We stopped in over 60 different cities across the country, went to startup meetups, startup weekends, startup weeks, incubators, accelerators and anything with a startup pulse. We made some awesome friends and met some great startups, many of whom came to Memphis for everywhereelse.co. We can’t do this alone. Last year in 4 campaigns we raised around $5,000 on indiegogo. For this leg of the trip we’ve got some interesting things we can offer our sponsors and we’re doing it directly below. Thank you so much for your continued support and let us know what city and state you’re in so we can connect on the road trip. This is our “attaboy” sponsorship feel free to get us as many extra value meals as you’d like. We’ll gladly thank you with a link in a thank you weekly wrap up on nibletz.com and give you a shot out on our twitter accounts. This sponsorship will help get us a taco from Moe’s or Chipotle, food is fuel, fuel is good . Feel free to get us as many taco’s from Moe’s and Chipotle as you’d like we will be extremely grateful. For this sponsorship we will give you a paragraph shout out with your link, description and Twitter handle in a per stop thanks for the Taco’s post. We’ll also give you a shot out on Twitter (info captured in the butto below). We take the Bolt Bus, Megabus and other regional cheap bus services everywhere we can because we boot strap to the point we call it sneaker-strapping. Your $25 donation can get us a lot more places than you would ever imagine on Megabus and Bolt Bus. For this sponsorship you’ll receive a new “nibz” short form story about your startup (identified as a sponsored nibz) along with a linkback in the logo and at the bottom of the story you’ll also get 2 shout outs on Twitter. For the stops on the trip that we can’t make by bus we have to drive and your $50.00 sponsorship for gas comes in quite handy. With your $50.00 sponsorship you’ll get a nibz featured post on nibletz.com as well as a thank you mention in our weekly thank you post with linkbacks. You’ll also get 4 tweets with your Twitter handle and link. You’ll breathe easier knowing that the nibletz crew will get most likely 2 nights out of this hotel money. We may not sleep, but rather stay up and work all night, but that’s ok with you because we’re all startup founders. With your hotel money sponsorship you and your startup will receive a “sponsored” nibz feature story about what you do. We’ll tweet the story out on our regular tweet schedule to nearly 150,000 followers and share across all of our social networks. The nibletz sneaker strapped patron sponsorship includes one “startup village” booth package for everywhereelse.co 2013, February 17-19th, 2014 in Memphis Tennessee. The Startup Village booth includes booth space, wifi, a chance to pitch for over $10,000 in cash and several other contest opportunities, name in program, description in virtual village and 3 attendee tickets. As part of the road trip patron sponsors your website will be mentioned in a rotation with other sponsors on our youtube videos from the road trip (not including SXSW). You’ll also get a sponsored feature story. Which will run in our social streams. Also, if you choose, you can send two t-shirts one XL and one M and we will wear them in videos from the trip. With the sneaker strapped saint sponsor package you will get everything in the Patron package including the startup village booth for next years conference. You will also get your logo prominently featured on the 2014 everywhereelse.co conference SWAG bag. Provided it fits in the tour schedule we will also stop by your startup for an event or meetup. If you choose we will wear your t-shirt in our videos as well. This sponsorship includes everything in the Saint sponsorship however the perks will be included during the SXSW 2013 coverage. This is an excellent opportunity for startups that can’t be at sxsw but still want added exposure. At $1800 Nick or Kyle will wear your startup t-shirt for an entire day and an entire day’s worth of on camera videos. Your startup will also be featured in all of our AOL Radio coverage as demonstrated here. Your startup will be featured in every video that we do during the “outro” see this link for an example. Finally, we will write two stories about your startup and tweet them out over the course of a week. We will also give you 40 additional Tweets. We’ve been on the ground covering South by Southwest since Monday. Why Monday? Because that’s when sxswedu started. The educational portion of SXSW is growing at almost the same rate SXSW Interactive grew at in it’s earliest years. This years education fest featured some great panels and discussions along with a Google classroom, great speakers and awesome parties. Startup Weekend EDU captured in a documentary, we have a recap of the screening. The Startup Bus teams from New York, Chicago and Mexico built a bonus startup, Drunkspotting, on the shuttle from San Antonio, more on that here. The founder of this startup couldn’t make it to SXSW he was pitching to First Lady Michelle Obama, video. Steve Case, Founder of AOL and Chairman of startup America talks about the importance of crowdfunding to early stage startups, video here. There are over 20 more stories already and a lot more coverage coming so make sure you keep checking nibletz.com the voice of startups everywhereelse. We’re sneaker strapping it, what is that and how can you help, click here. Teachers write between 200-800 lesson plans per year based on how many unique courses they teach. This was a major pain point for educators. Often times they would want to take one lesson and take part of it and incorporate it into another. This would be great if they could easily put their hands on that file. In 2009 Baltimore math teacher Scott Messinger became fed up with the old way of planning curriculum. EdTech was poppin up everywhere at the student level, yet teachers were still writing lesson plans in Microsoft Word, or the old fashioned way, by hand. Messinger taught himself to code over the next three years and started building what became Common Curriculum. According to whatweekly, in 2011 Robbie Earle joined Messinger as co-founder, after Education Hack Day. They launched Common Curriculum back in August and this week they were a finalist at LAUNCHedu as part of SXSWedu. We got a chance to catch up with Earle. Check out our video interview below. Clever, a platform that connects educational software providers with legacy Student Information Systems, has already caught the eye of major venture capitalists. Back in October, after completing the summer round at Y-Combinator, they raised $3 million dollars from some of the tech world’s elite venture capitalists including SVAngels, Google Ventures, Bessemer and Mitch Kapor of Kapor Capital. While getting into Y-Combinator, graduating and raising a big round of funding are all great, Wednesday night at SXSWedu they were crowned K-12 champions of the LAUNCHedu startup showdown. This award is better than your average pitch competition because it’s an award from their peers and their user base, educators. What began as a simple idea for a simple, yet aggravating problem, eventually prompted founders Dan Carroll, Tyler Bosmeny and Rafael Garcia to quit their jobs and pursue this opportunity full time. Another startup called LearnSprout is attacking the same problem, and a Startup Weekend EDU startup, Student Dash, attempted it but had to abandon the project because founder Kevin Tame didn’t have time to continue. Tame was featured in the recent Startup Weekend EDU movie. 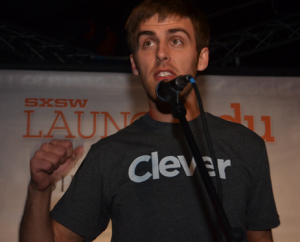 Clever has already received major traction and is building scale at a quick rate. Carroll said in his Wednesday pitch that the startup had already been deployed in 3,000 schools and has over 1 million student users. They also have over 40 paying app customers who pay them to access their platform. Nowadays people don’t have time for long tail language speaking courses like Rosetta Stone. Not only that but most courses, like Rosetta Stone, teach their students in just about the same manner you would learn a foreign language in high school. 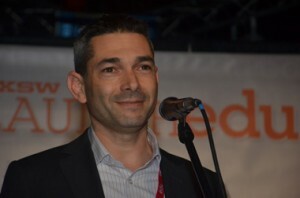 SpeakingPal, an Israeli startup, is actually more successful because the platform teaches English in a more natural format. SpeakingPal is a web based platform and also a mobile app platform that let’s the user engage with video content and actually have a “conversation” with the virtual instructor. The guys at SpeakingPal actually ended up winning the highered category at LAUNCHedu as part of SXSWedu. 50 years ago, a student challenging a teacher would be cause for a good paddle beating or wrapping on the students fingers with a ruler. Today, not so much. Argumentation is now at the core of the new Common Core State Standards, and distinguished Chicago educator, Eileen Murphy Buckley, understands that with a passion. As the former Director of Curriculum and Instruction for over 100 Chicago Public Schools, Buckley oversaw the implementation of this kind of curriculum system wide. Now she’s turned these important fundamentals into ThinkCerca a platform that helps build students critical thinking ability. With argumentation we’re not talking abut back talking the teacher, Buckley and progressive educators worldwide are teaching students how to create valid arguments about everything built on five principles; claim, evidence, reasoning, counter argument and audience. “ThinkCERCA is harnessing the unique combination of deep subject area knowledge, hard-earned, pedagogical design skill, and research-based expertise to build a marketplace that will give school districts economic access to the world’s largest selection of high quality literacy lessons. Unlike a the limited selection available in a static textbook, our dynamic marketplace will offer a distribution channel for expert teachers to refresh and deepen the lesson library in ways that both students and teachers find valuable.” Buckley wrote in a guest post to Chicago based Technori. 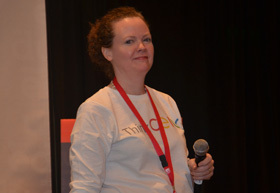 ThinkCera made it to the final round in the LAUNCHedu startup showdown as part of SXSWedu in the K-12 category. SXSW team coverage from nibletz.com can be found here. When I first sat down with Andrew Bender, President and CEO of instaGrok I was mesmerized at what I saw. I originally though that a “research engine” would be boring, or at best a fancy way to say search engine, and Google has determined we don’t need anymore of those. Once Bender took me through a demo I wished that instaGrok was around when I was in school. I told Bender that I am a very visual person. I “white board” just about everything, drawing webs, flowcharts and arrows all over the place. 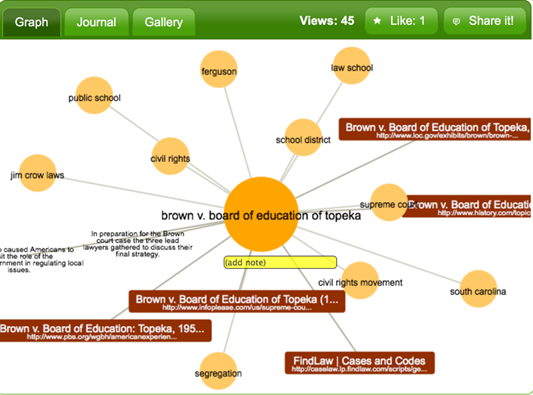 Well instaGrok takes whatever your researching and visually shows the user how things are connected. Bender showed me two examples. The first was gravity. As you can see from the grok above gravity is connected to Einstein, equation, orbit, object, universe, scientists, force, astronaut, and Newton. When you’re on the instaGrok site if you click on any of the circles another web appears showing how the connections are connected to other things. On the right side bar instaGrok connects the user to key facts, websites, videos, images, quizzes and a glossary. Now the user is connected to mountains worth of research in a very easy to understand and navigate UI. If a user was actually working on a research paper about gravity they could pin anything from the right hand columns directly into the grok. 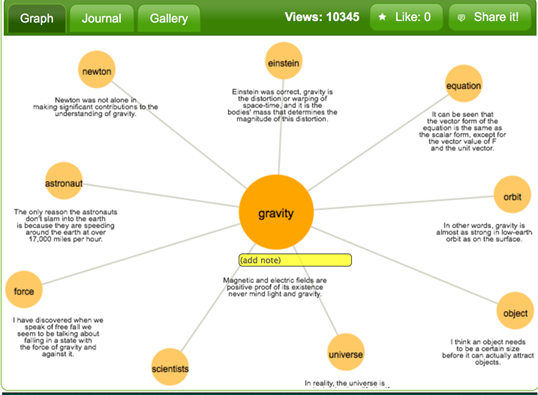 The other topic we looked at was “Brown v Brown” and a user built grok. This grok features a bunch of links that the creator has added, or pinned, to it with the information they need. You don’t need to register for instaGrok, but if you do you can save the groks you create for as long as you would like. There are so many reasons we like Flinja. First off, their name is short for Freelance Ninja, and any startup with the word Ninja in it rocks. Secondly they are connecting college students with ways to make money by sharing their service as free-lancers with college alumni. The startup, founded by Rebecca Bahr and Victor Young, is a market place for current college students to find free-lance employment opportunities from alumni. Bahr says they’ve pivoted several times. When they first set out on the free lance ninja concept the platform was closed to each students actual school. Well Bahr, who went to college in Montreal, found it hard to find people to connect with when she needed a service provider in California. Now, any college student can be a service provider to any college graduate from any school in their network. Students are utilizing Flinja to offer videography services, photography services, wedding planning services, tutoring in a variety of subjects and anything else that they could do for others for a little money on the side (legal of course). The hope is that the alumni or college graduates that hire the students as freelancers may be a gateway to more stable employment. The Flinja marketplace is self contained. When a college graduate is looking for a service provider they can search through Flinja, see a provider (students) feedback and ratings, set up the service, agree to pay and actually finish the transaction. Flinja takes a small percentage from the person hiring, not from the college student. UCLA was the first school to adopt the Flinja platform. Students are being hired as videographers, editors and tutors. Flinja is a finalist in the LAUNCHedu competition at SXSWedu in the higher education category. They will appear in the showdown later this week. We’ve got more SXSWedu coverage here. Startup Weekend Education is a 54 hour long event that utilizes the same startup hacking weekend format that traditional Startup Weekend events use. They’ve been held all over the country, including Silicon Valley, New York, DC, and Florida. There have also been several successful Startup Weekend Education events overseas. The movie, produced by Vinnny Verma of 1887 films, chronicles Startup Weekend Education events in Silicon Valley and New York City. In New York, the focal point is Kevin Tame, who taught 8th grade math at Booker T Washington middle school in Baltimore Maryland. The idea for his startup Student Dashboard, is that kids don’t like to spend time logging into all the various apps and platforms they need for school. Tame felt that if he could simplify the process he would give back a much needed commodity, time, and not only to the students but the teachers as well. On the west coast the film turns to Rob Schwartz a 16 year educator and principal. His problem was that students and teachers need better ways to produce and consume content. His startup, MySciHigh went on to win the Silicon Valley event and is now in 35 schools across the country. The movie was screened as part of the SXSWedu event at the legendary Alamao Draft House and Theater. 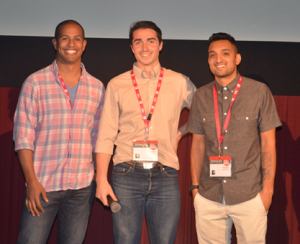 Startup Weekend’s COO Adam Stelle, Verma and Chapman Snowden of Kinobi and Starutp Weekend Edu all participated in a panel discussion after the viewing. One thing that caught my eye was during the film Tame had said that he had gone to the NY event only to work on his project and didn’t want to work on any other project. This actually goes against the grain of traditional Startup Weekend events. We’ve been to over 60 Startup Weekend’s and at those events entrepreneurs are encouraged to stay and participate whether their idea is picked for building or not. Stelle explained that at Startup Weekend Edu the hackers are actually teachers, and many come in specifically to get help “scratching their own itch.” Verma said that he had actually spent time contemplating this issue and went with it because if fit with Tame’s character. Regardless, the movie was a great look at what happens when you get people together working on common problems. “We’re too concerned about talking about the problem than real world action,” Tame said in the film in regards to teaching. He went on to say that at the Startup Weekend edu event people were talking about problems and solutions. Tame’s team didn’t have a designer or a developer. Tame and a partner ended up hacking together the entire idea, and a pitch deck with one minute to spare. Tame has transitioned from a Teach For America corps teacher to the organizations Director of Design and Technology, moving to this position in part because of his involvement with Startup Weekend edu. The movie, which is finally edited down and ready to go, will be online and shown at several startup events across the country. Find more of our Startup Weekend coverage here. As part of the programming in the Google Classroom at SXSWedu Google’s Cristin Frodella spent some time talking about the globally known Google Science Fair. Eric Schmidt, Executive Chairman of Google said it best last year when addressing a crowd about the Google Science Fair “We’re all scientists here.” Many of Google’s employees are engineers and scientists and spent many a day developing science fair projects to show off at school with a poster board and a cool experiment. Through Google’s global reach, widely respected brand and technology Google has taken the science fair online and across the world. The contest, now headed into it’s third year, reaches high school aged students across the globe and brings the top 15 to Google’s campus to show off their world changing science experiments to a group of distinguished scientists and judges. Of course the students also enjoy the thrill of being not only in Google’s campus but visiting surrounding science related places as well. Last year for instance, the students spent some time at the Tesla world headquarters. 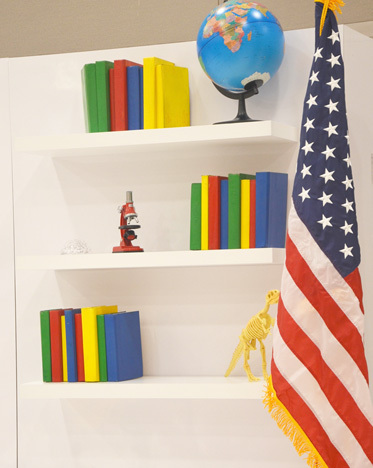 Check out the video below where Frodella gives some background on The Google Science Fair. We’ve got more from SXSWedu here. Educators, innovators and educational entrepreneurs have descended upon Austin Texas for sxswedu. This four day shoulder festival to SXSWi has doubled in growth every year since it’s debut in 2011. 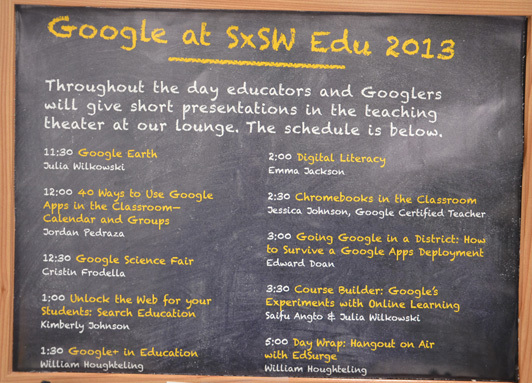 This year Google has opened up Google School at the Austin Convention Center. At Google School teachers, educators and innovators can learn about Google in the classroom. Google offers plenty of products for education. Here at the Google Classroom attendees can see how effective Google’s ChromeBooks can be for students in grades K-12 and Higher Ed. I just enjoyed a class taught by Jordan Pedrazzo on using Google Apps in the classroom. The focus was on using GMail and also Google Groups as a way to communicate with students and parents. Google’s educational services are perfect for all types of students even those in alternative education. Check our more of our SXSWedu coverage here. We’re gearing up to start covering SXSW on-site. Our coverage actually begins tomorrow at SXSWedu. The educational shoulder festival is gaining momentum and is now a full four days of programming. We’re covering SXSWedu and SXSWi this year. We’ve covered their other big shoulder event SXSWeco in 2011 and 2012. This is my 12th year attending SXSW. It started for me as going for the music festival when I worked in radio. I’ve spent the last four years covering SXSW as a tech journalist, the last two as nibletz the voice of startups everywhere else. SXSW began in 1987 as an alternative music festival. In it’s inaugural year there were 700 registered attendees. Last year the music festival portion of SXSW saw over 12,000 registered attendees and since 2010 SXSW interactive has drawn more attendees than the music festival. SXSW music is the largest festival of it’s kind with more than 2500 “official” performers and over 100 venues participating. The team at activ8social, a creative marketing agency that specializes in social media put together an awesome infographic that shows how SXSW has evolved since 1987. They humbly suggest that the infographic is awesome and after checking it out, especially for along time attendee, I must concur. Since 2010, SXSW Interactive has boasted more attendees than SXSW Music. Most of the attendees of SXSWi are between the ages of 21-40. More than 50% of the attendees work in creative or management. People at SXSWi have deep pockets! A quarter of the attendees have a combined household income of $100,000-200,000. Some of the biggest names in startups have launched at SXSW. Most notable are probably Twitter and Foursquare in the past few years. However, the 2006 SXSWi keynote panel included Jimmy Wales, the founder of Wikipedia and Craig Newmark the founder of Craigslist. The infographic also highlights Sarah Lacy’s biggest interview faux pax when in 2007 the audience turned on her while interviewing Mark Zuckerberg. In fact, her now good friend, contributor and confidant Paul Carr actually spoke very critically of her during that particular interview. We’ve got more SXSW13 coverage for you here.